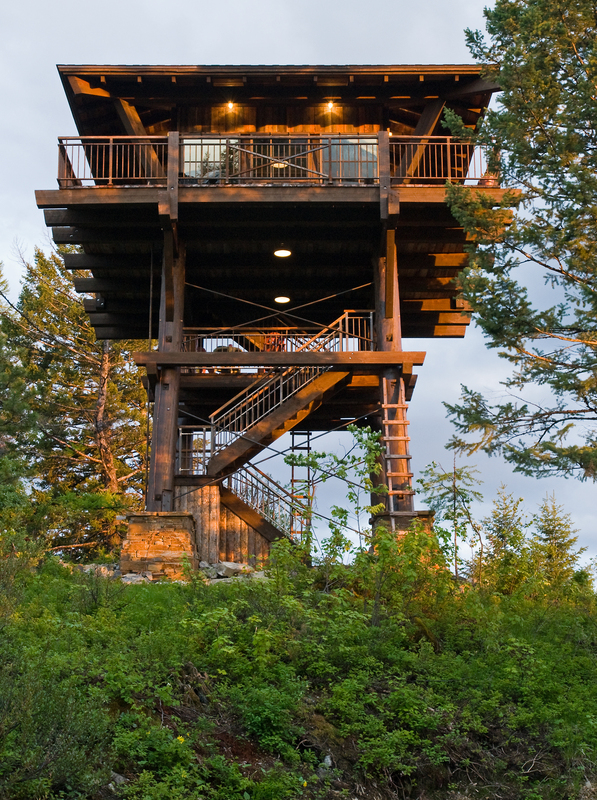 BICK AND BONNIE SMITH’S 34.5-FOOT-TALL FIRE LOOKOUT tower is surprisingly young, built just two years ago on a mountain northwest of Whitefish. But everything, from the light switches to procured timber, would suggest otherwise. And that’s the point. The width of the wrap-around deck, the length of the roof overhangs and, especially, the location of the stairs — eventually built outside the main room — were heavily scrutinized. Bick Smith and Scott Elden studied books featuring old towers nestled in national parks and, once the dimensions were decided upon, equal effort went into choosing every minute detail included in the home’s furnishings. 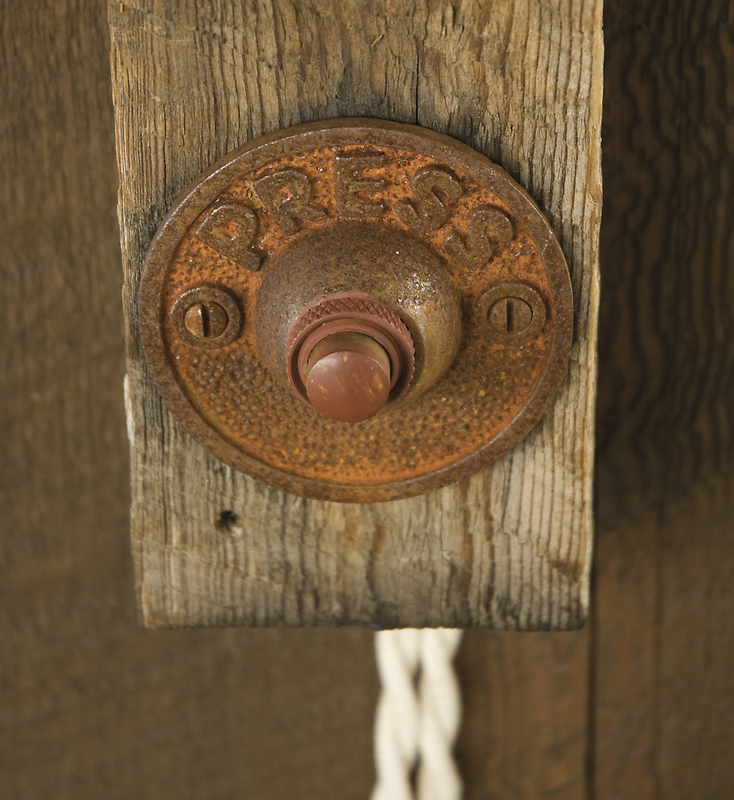 There are cloth-covered wires fastened to the wall with copper staples; the outside railing, purchased new, is well rusted by vinegar; and the door hinges are stained with Coca-Cola. A visitor won’t notice these elements straightaway, as each complements the other and adds to the experience the Smiths and Elden strove to create. And it’s more than the attention to detail that makes this lookout, which are traditionally used in remote areas to spot smoke caused by backcountry fires, appear like a precise replica in almost every regard; the location is, in fact, a perfect place to view fires. To the west are the Flathead and Kootenai national forests, where the Brush Creek fire burned about 30,000 acres two years ago. Rangers actually used the lookout, with the Smiths’ blessing, to keep an eye on it. And to the east are the steep mountain ranges that guard the entrance to Glacier National Park. Yet despite its initial appearance, the Smiths’ 200-square-foot fire tower isn’t altogether primitive, and it includes several features that backcountry rangers could only envy. There’s a flat screen television on the wall, plus a gas stove and a hideaway refrigerator. This particular lookout, after all, is often used as a second home. Bonnie Smith said her 17-year-old hosts sleepovers in the lookout with a half-dozen of his friends. Birthdays, holidays and even small conferences have been held here in what serves as a rustic studio apartment with dazzling 360-degree views. “It’s really surprising how much people use it,” Bonnie Smith said, as she flipped through her scrapbook, which documents how the home went from an idea hatched in 2005 to reality in 2007. Once the design was in place and the pieces of wood cut, Centennial Timber Frames in Kalispell was tasked with assembling what look like, from the pictures, giant-sized tinker toys. Mike Koness, co-owner of the company, said while assembly went quickly, it provided its own unique challenges. Since it was cut in a circle-saw pattern, the Douglas fir timbers were more difficult to align and it was crucial that the base, four logs splayed out like the legs of a stool, sat on the foundation correctly. Still, the frame, pieced together on the ground and erected in three parts, was built and secured to the rock foundation in one day. Once the framing was complete, carpenters arrived to fill in the deck and walls. The wood used, once again, was specifically chosen by the Smiths, who salvaged it from a dilapidated barn that their neighbor had planned on burning to the ground. It only furthers the couple’s aim of seamlessly blending the tower into the rugged surrounding environment. Unless one is specifically looking, it is nearly impossible to see the lookout from any major thoroughfares — even the subtle lighting scheme adds to its inconspicuous presence. “We wanted to do something that wouldn’t take away value from the land,” Bick Smith said. The Smiths moved to this land after climbing the corporate ladder in Minnesota. The couple wanted to raise their son in Montana and worked for years to buy the property near their home where the lookout now sits. The property, while private, is also shared. This fire season the couple has once again allowed rangers to climb up periodically to spot smoke after lightening strikes, and the Smiths have even auctioned off nights in the fire tower to raise money for charity. 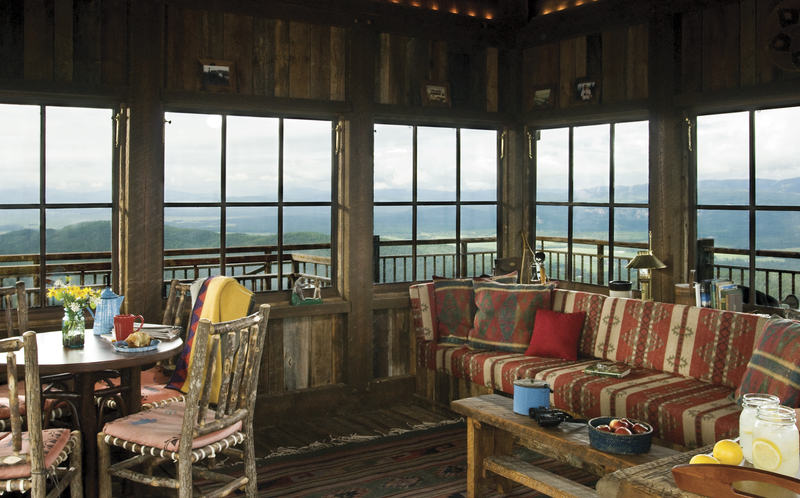 Sitting 34.5-feet up, Bick Smith boasted that his vintage lookout far exceeds his expectations. And it appears he may have started a trend. One of his neighbors has now built a private lookout and another one nearby is under construction. But it would be hard to match Bick and Bonnie Smiths’ effort to replicate a lookout that could convince a passerby that it is a distinctive piece of history. 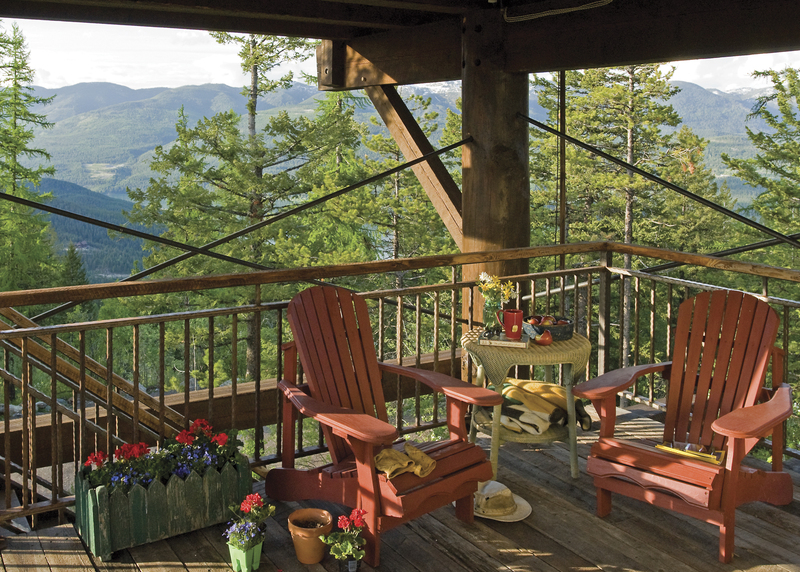 The fire lookout is 200-square feet and used for everything from sleepovers to small conferences. After much discussion, the stairs were built outside the main room. The Smiths went to great lengths to make the lookout appear like a vintage replica in every regard. Surrounded by forest lands, rangers actually use the Smiths’ lookout to spot fires in the summer. 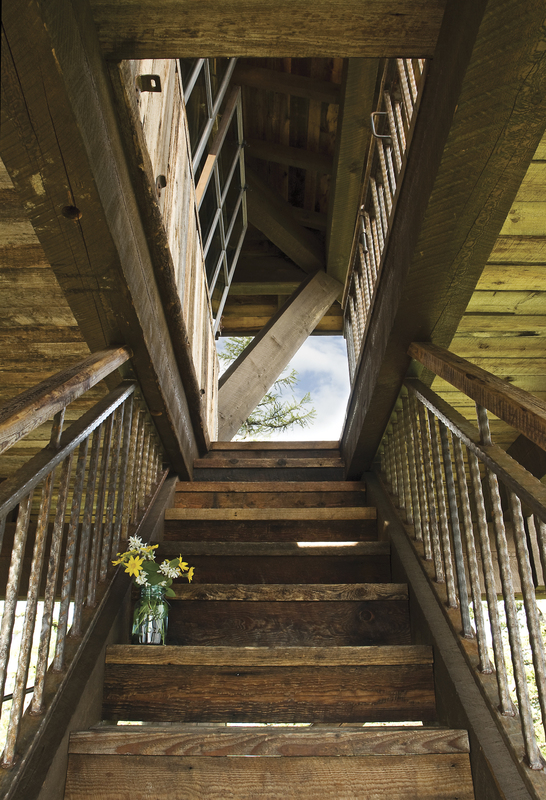 The 360-degree views stretch all the way to Glacier National Park, instilling guests in the tower with a sense of awe. Wild flowers welcome you upstairs.